This past weekend, I had my second 10K. I shaved 2 minutes off of my first 10K time and this was a much harder run. When I ran the second race, I thought for sure that I was significantly slower than the first time. I think I pushed myself significantly harder, but the first race was almost entirely flat and this one started and ended with a big hill and had some rolling hills in between. I've discovered that I don't like hills (surprise! ), so I'm going to be practicing them more. My running mate, Kenneth, and I looked at where our next race should be. 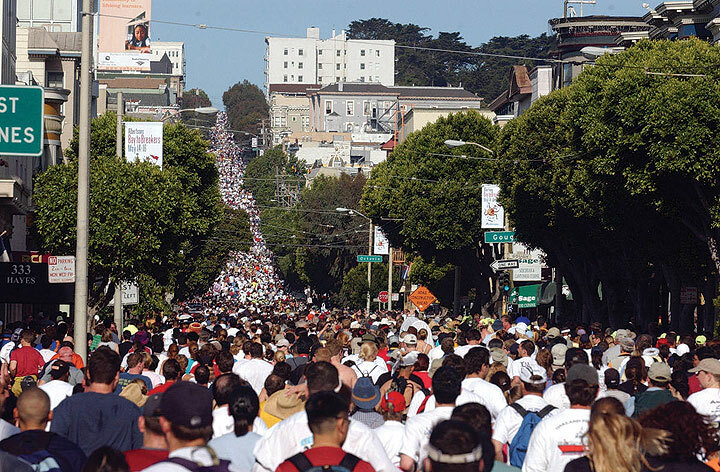 We decided on Bay to Breakers in San Francisco. I've known about that race for 20 years and I've always been curious. I remember living in San Francisco and knowing when the race was because it's a citywide phenomenon, though I never attended it. I did a bit more research and it turns out the race is crazy. Very San Francisco. 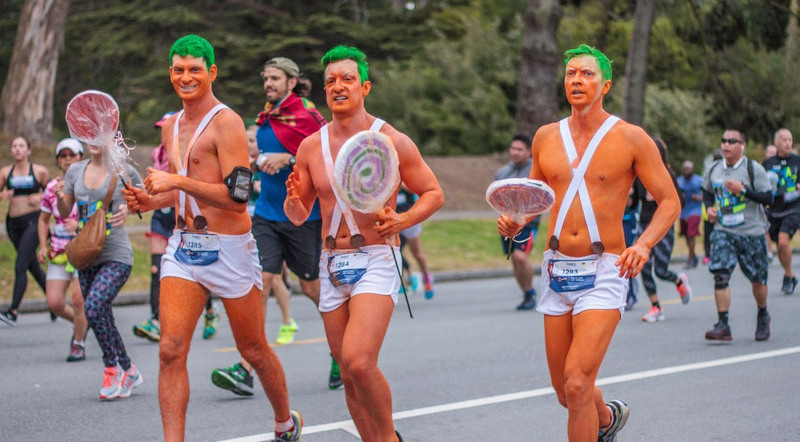 Runners are usually naked or in costumes, there's tortilla tossing, and lots of people treating it as a big party. In terms of effort, it's 12K - which is longer than I've run before but totally doable. Everyone that's run the race mentions that there's one very big hill: Hayes Hill. It is apparently quite daunting and gets to an 11% incline. I've done a 12% incline at Mile High, but not for long and it really knocked the wind out of me. Of course, you can always walk a hill and plenty of people do. I've read that several houses on Hayes Hill turn into party stops. But I'd like to run it. I thought about how I was going to train for the race and what I could do to make Hayes Hill more manageable and I decided that the best thing I could do (beyond training) would be to lose 10 pounds. After all, that's 2 months away. I could lose 1.2 pounds per week which is aggressive but totally doable. The timing is right to lose 10 pounds. Generally my diet goals are "let's try to eat better and hope it pays off." My diet is not terrible but certainly isn't where it could be. In general, my portions are in control. A good amount of my diet is in the form of vegetables but not quite the 50% that I'd like it to be. My diet lacks focus and consistency. I'm down 30 pounds from 2.5 years ago, but in the past six months, some of the weight has come back on. I'm going to take the next 2 months to see how good I can get my diet. I'm going to take a two-prong approach to dieting. My big problem is and always has been sugar. I have a terrible sweet tooth. A little splurge or treat seems to suddenly turn into a regular and hard-to-break habit. I have to keep sweets at a constant distance so that they don't creep back into a routine. Limiting my sugar intake is hard at first, but eventually the cravings subside. My other approach will be to incorporate some fasting into my life. I've done it in the past and had great results. It will help make sure that I'm at a calorie deficit for the week. It's hard, especially at first, but it definitely works and gives me a lot of energy. It's kind of fun to get reacquainted with hunger and realize it's not the enemy. I get a lot of energy and tend to have great workouts - especially the day after a fast. There are a few different ways to fast. I'm going to start with doing an 18 hour fast one day a week and see how it goes. I'd like to work up to a 24 hour fast once a week but that is often very hard logistically. My problem with intermittent fasting in the past is that I got into a binge and purge cycle. I started fantasizing about the big splurge meal I'd have when I broke my fast. My regular diet started suffering because I felt like I was going to fast it all away. I don't want to go down that path. I want to stay healthy on my non-fasting days. With these two approaches to weight loss, I thought about the minimum and maximum effort I could put in over the next two months. The minimum amount of change I could make would be to limit sugar to one day a week. I've done that in the past and it's doable and generally helps me lose weight. The maximum amount of change I could make would be to limit sugar to one day a week and to do two days of intermittent fasting. The happy medium between those two things is a little more of one and less of another: limit sugar to one splurge per week and do an 18 hour fast once per week. This makes sure that my weekly caloric intake is definitely down and my sugar addiction is well within control. I expect the first week of this to be a bit brutal, but in my experience, I notice such an increase in energy levels after the first few days, that I can tough out the cravings. When I have cravings, I'm allowed to have fresh fruit for something sweet. If I'm hungry, I have a plethora of healthy snacks that I worked on with my nutritionist. Is this plan specific and measurable? Yes it is. Is this plan achievable? It's definitely challenging, but this is all work I've done in the past. Yes. It's certainly achievable. Is this plan relevant and timely? With Bay to Breakers two months away, it is very relevant and timely. To help me make sure I stay on track, I've printed up a calendar for the next 9 weeks so I can mark the days I fasted and the days I had my sugar splurge. I'll also take any other notes that are diet related. This is very doable, though will definitely be a challenge. If I lose sight of my goal, I can think of Hayes Hill looming before me. I've read that a lot of houses on Hayes Hill treat Bay to Breakers as a party. I know that there's going to be people cheering on Hayes Hill. They will be cheering for me. I want that feeling that I came prepared for Hayes Hill - I shed the 10 pounds and I will be climbing that hill in triumph. The rest of the race is icing on the cake. Well, it's time to get in shape. I've been kind of half-assed about it for several months, but the weather is good and there's no reason I shouldn't be outside being active. John Hodgman's words on fighting procrastination really strike a chord with me. Sometimes you just have to force your fingers to start typing.